The Life Fitness T3 is ON SALE! The LifeFitness T3 treadmill is an intro model of the line-up. LifeFitness has an excellent reputation for quality and durability,and they charge a premium price for that reputation. However,the T3 treadmill offers the Life Fitness quality without requiring taking out a second mortgage. When shopping for a treadmill, realize you will find other brands and models that will match the features found in the Life Fitness T3 and cost considerably less. It is the quality of the components and the engineering that define the treadmill. With the LifeFitness T3 treadmill you are getting a residential treadmill built by one of the leaders of commercial grade treadmills. The Life Fitness T3 Treadmill got an “Excellent” rating for ergonomics and ease of use from a leading consumer magazine. Purchase the Life Fitness T3 Treadmill Today! The Life Fitness T3 Treadmill typically starts at $2,599. 3.0 continuous duty HP motor — This motor will run effortlessly at higher speeds. Designed for the abuse that comes with running. 60″ x 20″ treadbelt — The length of the belt will handle the long stride that come with running and interval training. Shock absorption — The FlexDeck shock absorption absorbs the impact of your foot plant at the front of the deck, while giving your a solid push-off at the rear of the deck. They claim it reduces impact by nearly 30%. Heart rate monitoring — There are hand sensor and wireless telemetry heart rate monitoring, which is fairly standard at this price range. The Life Fitness T3 treadmill comes with your choice of consoles. An app that allows you to create custom workouts and track results at www.lfconnect.com. You can upload your stats and download custom workouts through your iPhone or Android device. The MSRP for the T3 with the Go console is $2,599, and the version with the Track+ console is $2,999. You typically can negotiate that price down or get free shipping and set-up when dealing with a fitness equipment specialty store. Buying the LifeFitness T3 treadmill is like purchasing a Mercedes, but settling for the least expensive model. You are not getting all the bells and whistles of the high-end models, but you are still getting some of the same premium quality for a reasonable price. You are buying their reputation for exceptional biomechanics and durability. 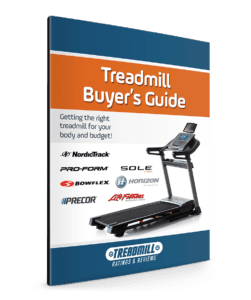 If you are sold on the concept of buying a residential treadmill from a company that also builds commercial models you probably want to also look at Precor, Landice, True and Vision Fitness. Each has some impressive entry level treadmills and outstanding reputations. However, with any of these companies you are paying a premium, and the question is do you need such a high-end machine for the home? Companies like Sole, Yowza and NordicTrack build some heavy duty machines for considerably less. They may not be quite as durable and their biomechanics and engineering may not be quite up to the standards of LifeFitness, but you can save as much as a $1,000. That said, I was considering buying a Hyundai Sonata, because you got a lot for you money. Then I made the mistake of testing a Audi A4. Guess which one I ended up with. Also see the Life Fitness T5 Treadmill Review.